How did the past four years fly by so quickly?! It’s almost time for graduation, and for some Dickinsonians, that also means it will soon be time to make a first student loan payment! You remember all of the details from your Entrance Counseling four years ago, right? There are a lot of things to consider when it comes to student loan repayment, but it all boils down to a few highlights. Come to a 30-minute (or less) Student Loan Exit Counseling Workshop to get the details. All sessions are open, but RSVPs are strongly encouraged. Watch your Dickinson email for RSVP details. One of the most common questions we get in Financial Aid is, where can I find outside scholarships? Applications are due May 1st, 2018. Click here to apply. Scholarship winners will be notified this summer. If you’ve been here for more than a year, and you receive financial aid, you know we collect a new application every spring. Most domestic students will file a FAFSA, complete an online application through the Gateway, and submit other requested documents. We’re so excited to offer you a new, secure way to send us your financial aid documents! Now you can upload files (.pdf, .doc, and .docx) through the Dickinson website. Last fall, we started the search for Salt Ambassadors. Over time, we decided to broaden the scope of the program, adopted the name “Savē” (more on that in another post! ), and we’re continuing to grow. We’re always looking for students who believe that personal financial literacy is important, and who want to help us create a program that meets the needs of all Dickinsonians. If you think you might be interested, reach out to us via email (financialliteracy@dickinson.edu) or through EngageD to learn more about this unique opportunity to leave a legacy. Thanks to the Dickinsonian for helping us spread the word! 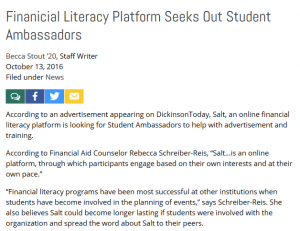 Financial Literacy Platform Seeks Out Student Ambassadors, by Becca Stout ’20. We were really excited to be featured news in Dickinson Today last spring, when MaryAlice Bitts-Jackson wrote an article on our efforts. 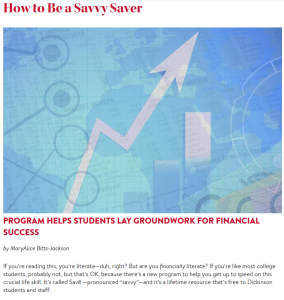 You’ve probably only heard of Savē recently, but we’ve been laying groundwork to bring financial literacy to Dickinsonians for quite a while. Last fall, our adviser met with The Dickinsonian to talk about the new effort.